Parvovirus B19 (B19V) is a human pathogen with a remarkably narrow tissue tropism. We have revealed a highly selective process of cell entry controlled by the interaction of a viral capsid protein, named VP1u, and its cellular receptor. This receptor has not yet been identified, but our preliminary results indicate that its expression profile is limited to a few cells types within the erythroid lineage. 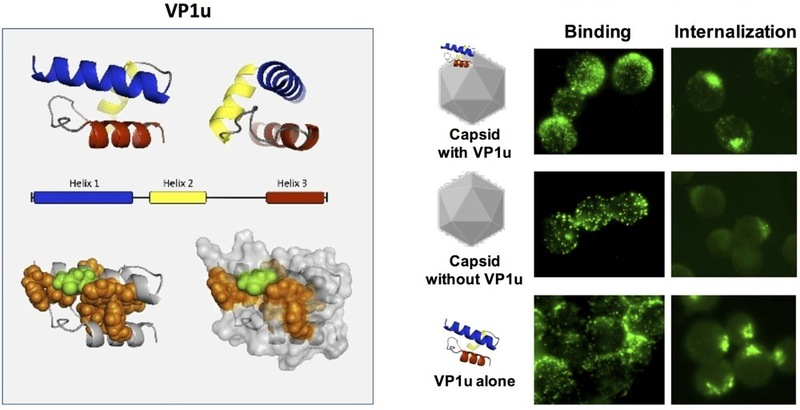 This new model of B19V infection controlled by VP1u correlates with the exceptionally restricted tropism of the virus. This work was carried out in the group of PD Dr. Carlos Ros. "The Receptor-Binding Domain in the VP1u Region of Parvovirus B19"
Viruses, 2016, 8(3), 61/1-16; doi:10.3390/v8030061. "Parvovirus B19 uptake is a highly selective process controlled by VP1u, a novel determinant of viral tropism"
J. Virol., 2013, 87(24), 13161-13167; doi:10.1128/JVI.02548-13.